Here are some photos from our installation at the Alchemy Film and Moving Image Festival in Hawick. Videoed choreography from Claire Pençak with music composed by myself and Alessandro Altavilla. Claire's work takes its name from George Mackay Brown's 'The Weaver', and is based on the signalling of Orkney Lighthouses, with the choreography conveying 'the collision of wave on rock, ships that pass in the night, the scanning beam of a lighthouse on dark seas'. We installed in the Crown Business Centre on Hawick Highstreet, blacking out the windows to transform this former office space into a darkened room illuminated only by the beam of the projector. 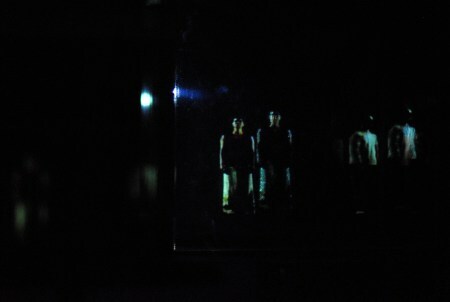 The video of Claire's choreography was projected onto a perspex cube, creating multiple images of the dancers on the surface of the cube and onto the walls. The music draws on data from cycles and signals of the Orkney lighthouses, which gave rise to multi-layered patterns which ebb and flow, creating looming waves of different intensities. The process began by recording fragments for baritone/tenor/alto saxophones and double bass before creating an electroacoustic composition which combines these recorded sounds with electronics. The saxophone and double bass parts were played by myself and bassist John Pope.